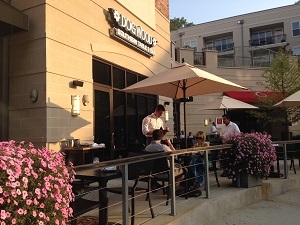 Bacon jam with country bread, grilled shrimp with pickled red onion and jalapeño aioli, choices of peach or bourbon BBQ sauce, and fig and goat cheese gelato are a few examples of the unique offerings that warm hearts and put smiles on faces at the Dogwood Southern Table. The culinary artisans at this Charlotte, North Carolina, establishment surprised and delighted my party with daring combinations while we sat at the Chef’s Table enjoying the entertaining company of the talented kitchen staff. “We don’t have a set menu,” says Executive Chef Scott Hollingsworth. “We create a relationship with our farmers and ask them to bring us what they have. We work with what they bring us.” This philosophy insures the diners get the freshest food available. “The flavors of fresh foods stand on their own,” Chef Scott believes. “Good quality food doesn’t need much help from us to enhance it.” This is quite a modest statement from a chef who runs an amazingly creative kitchen. It is not just what is served, but how it is served that makes this place special. Traditional-style dining is available, but for special occasions, call ahead to reserve a place for up to eight guests at the Chef’s Table. The regular menu is available at the Chef’s Table, or a unique Chef’s Menu can be created with a week’s notice. Think birthday, anniversary, or any celebration for the person who has everything. An evening at the Chef’s Table will always be unique. For a set price of $75 per person for a five-course dinner, or $125 per person including drink pairings with each course, the chef will create a meal just for your party, with the best of what is available that day. 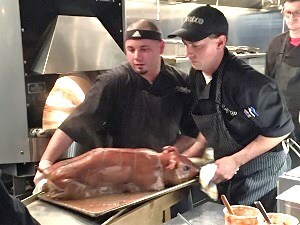 The night I was there, Chef Ryan Dougherty and his crew were roasting a whole hog for a party of 14. If the food isn’t amazing enough, there are the cocktails. Bar Manager Brian Lorusso, a.k.a. “The Chemist,” has created a menu of cocktails so unique and dynamic it is presented on a tablet. Scrolling through the tablet allows patrons to not only read the enticing descriptions of the cocktails, but to see photos of them as well. The Barkeep’s Call lets guests choose a liquor base, letting the barkeeper do the rest to create a special concoction. Brian “The Chemist” showed up at our table with a plate of three little piles of cinnamon bark, which he lit, then covered with glasses, to infuse the cinnamon smoke into the glass. One ice cube and a whisky concoction later, and we were all enjoying his creation. Every other Monday the restaurant hosts Community Suppers by reservation only. At $50 per person, the four-course dinner with drink pairings offers themed dinners highlighting local beers, bourbons, whisky, or wines. Information about the dinners is available on the website. 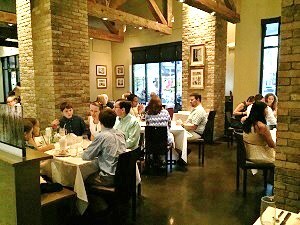 Guests are seated at tables of 10 to 12, making it a great place to go whether you are dining alone and want to make new friends, dining with a small party and want to mingle, or gathering your own large group for a special evening. The Dogwood Southern Table highlights what is local and lovely about the Carolinas, making it a worthwhile stop. The next diner’s experience will not be the same, but I am sure it will be equally enjoyable.